Industrial liaison and technology transfer are crucial to explore possible collaborations of research infrastructures with industrial partners. They also allow to increase the impact of research infrastructures as an innovation driving force for the society at large. However, there are several challenges to be faced for such a liaison to be successful. 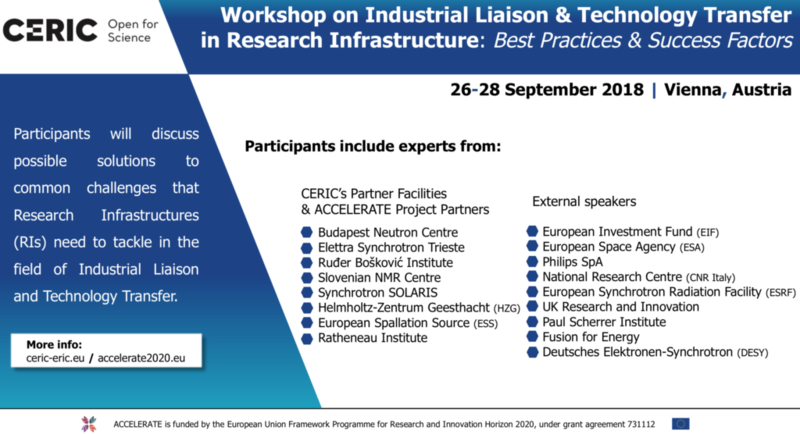 On 26-28 September 2018, the Workshop on Industrial Liaison & Technology Transfer (IL/TT) in Research Infrastructures (RIs) will be held in Vienna to discuss possible solutions to common challenges RIs need to tackle in the field of IL/TT. The event, organized by CERIC in the frame of ACCELERATE, will gather the distributed IL/TT staff of CERIC and its Partner Facilities to share questions and best practices stemming from their experience as IL/TT professionals working in the research environment. External experts will give insights on aspects ranging commercialization models, coordination with researchers and management of external collaborators’ networks, intellectual property management and will present major success & failure cases. The scope of the event is to define effective synergies between facilities through the support of CERIC. An additional expected outcome of the event is a strengthened bond among CERIC’s partners, which may steer a stronger coordination of joint actions in the future.